One tough Airseal Vegan Boot! Six eyelet version of our popular 10 eyelet para-trooper style boots. Less eyelets make for a quicker to pull-on boot, plus we love the dimensions of these boots! -They look great from every angle. Chunky soles with internal stitching and welded heat-seal construction make for well built and long lasting footwear. Part bellows style tongue increase water-resistance. Polish or regular shoe-care can help improve water-repellency. 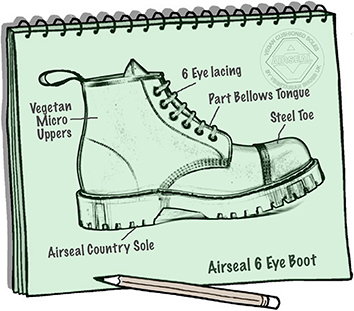 In our quest to make the ultimate cruelty-free boots we have produced the Airseal Boot range which incorporates our own brand of Airseal soles. Airseal Boots are always at the top of the list of our favourite footwear, we have sold loads of these boots over the years, the only trouble with this style is that we make them too well and have to wait a long time for repeat orders! The toughest, hardest wearing and most water resistant breathable material that we use. Like all our materials it takes little 'breaking-in', is exceptionally like high quality leather in performance and has a distinctive grain. Use our polish or dubbin.